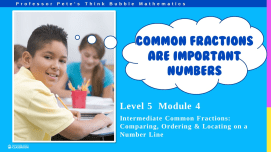 Activities to extend students' fluency with numbers by tackling fraction computation done mentally. Mental calculations of multiplying a number by a fraction. Links dividing a number by a unit fraction (included in the Division Number Fact series), then multiplying by the numerator. Mental strategies for comparing fractions with and without converting them. 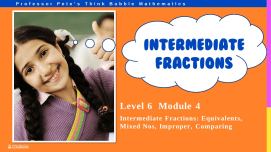 Revises multiplying fractions with whole numbers and converting between mixed numbers and improper fractions. Add and subtract common fractions with the same denominator, with and without regrouping. Revises multiplying fractions with whole numbers and equivalent fractions, with both vertical and horizontal layouts. Add and subtract mixed fractions with the same denominator, with and without regrouping. Vertical layout is used. 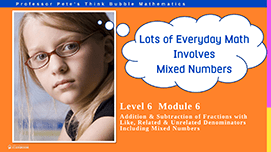 Revises multiplying fractions with whole numbers and equivalent fractions. Calculating Australian GST of 10% on small and large amounts. Identifying the GST component of bills and invoices.